What Do Oris Watches and Staghorn Coral Have In Common? We’ve all seen high end watch companies partner with car companies, racing teams, sports teams, etc. 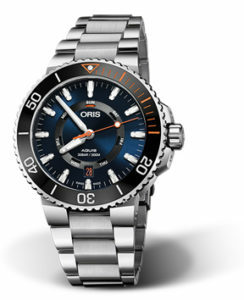 Rarely do you see them partner with an environmental non-profit like the recent joint effort between the Coral Restoration Foundation and Swiss watchmaker, Oris. The watchmaking company was moved by the work of the foundation and was inspired to create a special model of the Aquis dedicated to supporting the Coral Restoration Foundation. Corals are vital to the ecosystem. They provide a barrier break to waves and tides. By doing so, they prevent erosion and protect coastlines from storms. Coral reefs also provide food and shelter to sea life, thus creating income for coastal communities through tourism and fishing. Over fishing, pollution, development and irresponsible tourism exacerbate the destruction of coral reefs. The sale of the Oris Staghorn Restoration Limited Edition watch will help the foundation in the preservation and renewal of the world’s coral reefs. In 2015 the non-profit replanted over 20,000 native corals and began preparing 40,000 more for future replanting. Given that Oris has been making diving watches for over 50 years, the pairing was an easy choice. Oris has partnered with other conservation groups and the Coral Restoration Foundation’s outplanting program was an inspiration to the environmentally-minded watch company. The watch, itself, is quite inspirational. The dark blue dial and white markers are punctuated with bright orange, an homage to the colorful Staghorn coral. The easily visible color highlights the bezel’s zero marker, the central seconds hand and the day and date indicators. Like all Oris watches, the Staghorn Restoration Limited Edition is an automatic mechanical watch and it features a uni-directional rotating bezel with a ceramic insert for timing dives. 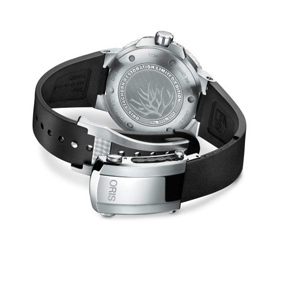 Decorating the back of the 43.5mm stainless steel case is a Staghorn coral and the limited edition number. Throckmortons Watches & Jewelry™ © , All Rights Reserved.